Hello there! Today Simon Says Stamp is having yet another STAMPtember collaboration! And this time its Clearly Besotted! I don’t have any stamps by Clearly Besotted in my stash, so it was really nice to play with a new-to-me company. 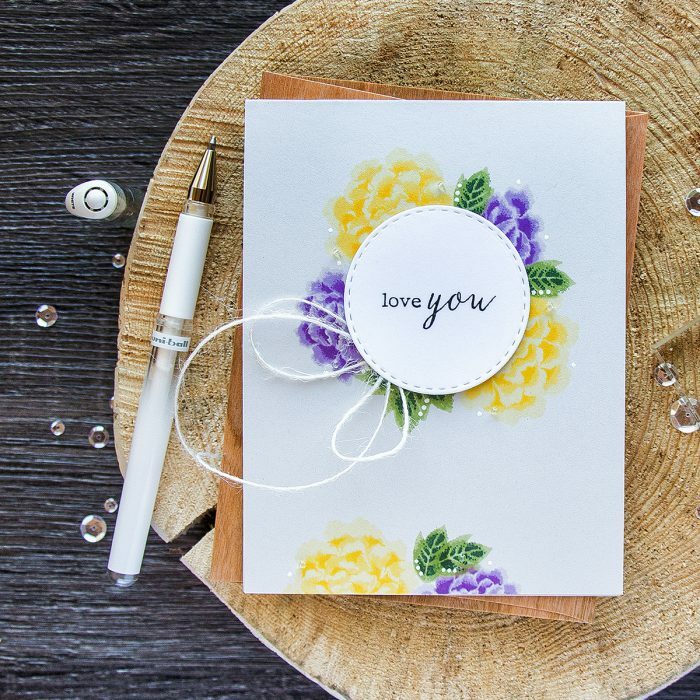 This stamp set, Layered Chrysanthemums, features stunning multi layer flowers and leaves. I decided to go with a not very common (for me) color combo and stamp flowers in purple and yellow. For the leaves I used traditional green. Because I always want to keep my layering stamps fresh and clean for as long as possible, I used Altenew inks, they almost do no stain clear stamps and this is especially important for layering sets in my craft room. I’m linking to specific colors I used below. My stamping was done on Simon’s Fog cardstock, first time stamping using colored ink onto this light gray paper. I didn’t use anything other than dye inks (you can add a layer of pigment ink, white pigment ink, before stamping with dye ink onto dark paper to maintain the ink color) to stamp my images and was very happy with the results. 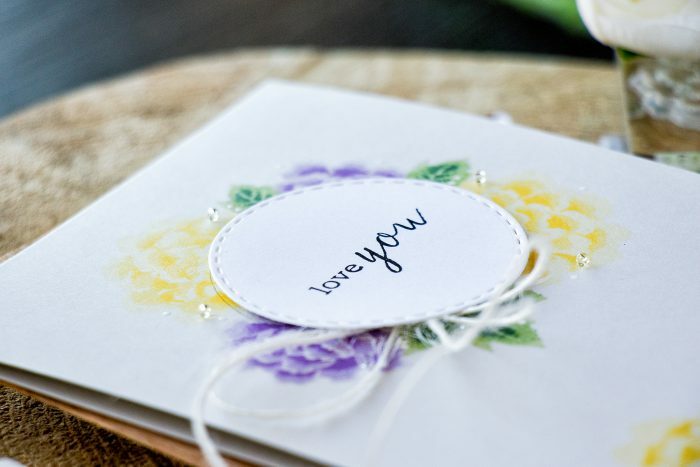 To stamp I first drew a circle using a pencil and stamped flowers creating a wreath. To balance things out I also added several flowers to the bottom of my card base. 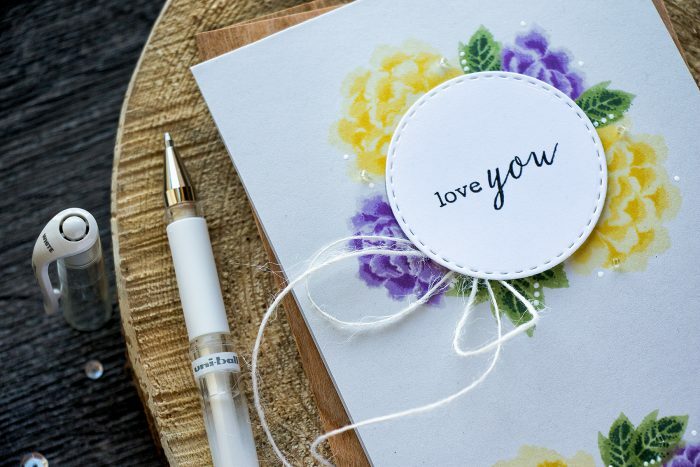 To stamp a sentiment I used Simon’s Stitched Circle die and stamped a simple Love You in black ink. 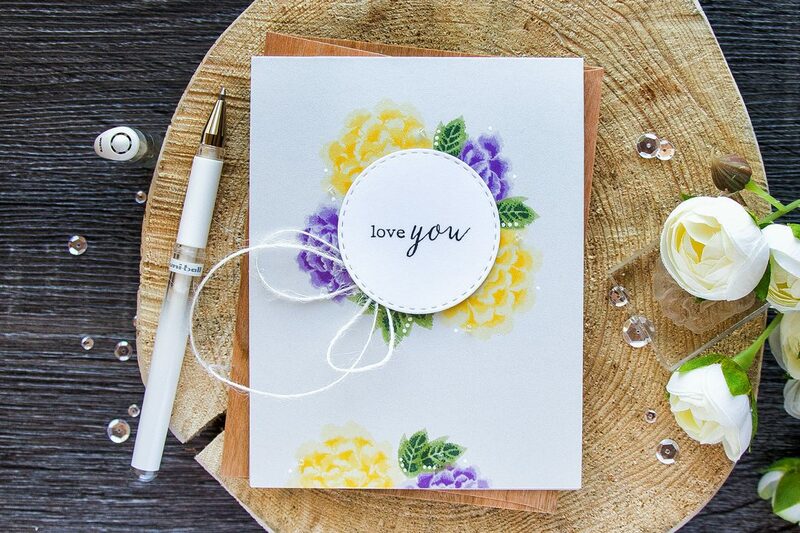 I added some natural twine, a few sparkling beads as well as some white gel pen dots to finish this card. Just beautiful as always, Yana! This is so elegant and beautiful! Amazing set! I should try stamping on light gray as well. Really like how it looks. thank you, darling! Yes, that gray is fantastic! Beauuuutiful Yana! What a pretty flower set. I love the love you font and the beads, so dainty. Thanks for sharing and inspiring. thank you so much, Lisaerica! This is absolutely STUNNING Yana. The colours of the flowers are gorgeous and the beads are so delicate and unassuming, a real pretty addition to finish it off! Very beautiful card Yana ! This stamp set is gorgeous and the colors you chose are awesome !